The great Indian yogi Paramahamsa Yogananda said, “Man is born on that day and that moment when his individual fate is in perfect mathematical harmony with the progress of the stars in heaven”. How the planets are placed in ones horoscope at the time of birth determines the good and bad effects of ones life and the time of their effect. In every horoscope some planets are well placed and some are badly placed. Hence we go through success and failures, happiness and sorrows in various aspects of life in different time slots in varying degrees. Certain planetary conflagrations give rise to strong negative effects called “Doshas”. The Vedic scriptures and the astrology scriptures prescribe various poojas to ward off the negative influence of the planets and to improve the benefic effects. ‘Nava’ means nine. ’Graha’ means planets. As per Vedic Astrology, there are nine planets that influence our lives. The position of planet at the time of human birth will have influence on his actions and reaction to different situations in his life. Every Life as it is has its ups and downs. With there is improper planetary alignment for an individual it is called as a “dosha” or negative influence. Due to these “Navagraha doshas” people fall into depression and certain low moods. This low period may last for some period based on the power of the planet. However this can be averted with intelligence. Connecting to the cosmic intelligence to avert any hindrances in life and to bestow tremendous peace and success in life, Navagraga pooja is conducted. You might have noticed that as the Moon grows (Purinma) in first half of the month, the waves in the Ocean rises and their aggression will subsides as we approach no moon day (Amavasya) According to this vedic science, these planets and their positions, will have influence on human body and mind. Navagraha Puja is a Vedic ritual which produces tremendous positive energy, and helps people to gain courage to face any situation in their lives. The Vedic ritual performed traditionally for these nine planets (Navagrahas) dilutes the negative influences and infuses peace and prosperity. 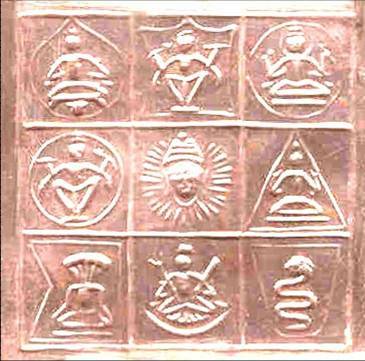 With the blessing of these nine planets, human being can attain good health, wealth, prosperity, Education and Knowledge. Navagraha Pooja is a collection of powerful rituals performed to the idols. Homa is fire ritual and an intense spiritual practice which becomes powerful meditation technique when performed with devotion. We invoke the cosmic energy and visualize it in the fire. Offerings to the deity are offered through the fire. ‘Nava’ means nine. ’Graha’ means planets. As per Vedic Astrology, there are nine planets that influence our lives. The position of planet at the time of human birth will have influence on his actions and reaction to different situations in his life. Every Life as it is has its ups and downs. With there is improper planetary alignment for an individual it is called as a “dosha” or negative influence. Due to these “Navagraha doshas” people fall into depression and certain low moods. This low period may last for some period based on the power of the planet. However this can be averted with intelligence. Connecting to the cosmic intelligence through fire ritual and to avert any hindrances in life and to bestow tremendous peace and success in life, Navagraga Homa is conducted. With Navagraha homa not only the doshas with the body but the space in which the ritual happens and the people who attend the ritual will all be benefited and blessed. Through this homa when done as a personal spiritual practice, the energy is brought from the nirvanic to the physical layer through all subtle layers and radiate. This homa ritual not only helps in spiritual growth but with the offerings it radiates and heals the space and the others who attend this fire ritual. The following is the brief explanation about each graha and its influence on human kind. 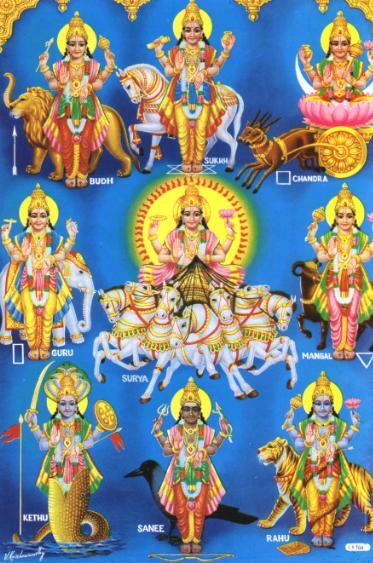 Surya or Sun is the most powerful living God - whom everyone can see, perceive and pray. Presiding deity of this planet is God Siva. Sun bestows good health and prosperity. Moon is the planet, which rules over mind and gives success. Chandra or Moon is a lovable God - Pleasing to the children as well as elders, universally appealing to everyone whatever may be the religion. Goddess Parvathi rules the planet. Moon is considered as very important planet for astrological predictions. The Moon, at the time of birth is found in a particular star and it will be taken as the star of the person born. Mars is the planet, which gives prosperity and wealth. Angaraka or Mars is regarded as a God of martial character, red in every aspect. Even the Romans held him as their Guru. He is the Son of Earth and is ruled by Lord Subramanya. Mercury is the planet which gives knowledge. Bhudha or Mercury is considered as the greatest among the wise. This Devata bestows wisdom and wealth on his devotees. He is ruled by Lord Maha Vishnu. Jupiter gives education and knowledge. Brihaspati is the Guru (Jupiter). He results in a cure from ailments and helps one cleanse his/her negative emotions and gives strength, valour, longevity, etc. He grants the boon of fatherhood to the childless, good education (Vidya). He is ruled by Lord Dakshinamurthy. Venus gives the knowledge of art, music etc. Sukra or Venus is the bestower of long life, wealth, happiness, children, property and good education. He is ruled by Goddess Mahalakshmi. Saturn gives happiness. Saniswara or Saturn, is generally known to affect one adversely on occasions when he occupies certain positions in one's horoscope. A prayer to him, especially on Saturdays, is said to mitigate the hardships one will have to face during these periods. Saniswara is considered equally a bestower of all benefits to the devotees who pray sincerely to him. He is ruled by Lord Yama. Rahu makes the life stronger. Rahu is instrumental in strengthening ones power and converting even any enemy into a friend. Kettu brings prosperity to the devotee's family removes the effect of bad, illness arising out of poisonous matter entering one's body. He grants good health, wealth and all round prosperity. Indian Astrology associates the following planets with the gods/goddesses as follows: Sun: Lord Siva Moon: Goddess Parvathi Mars: Lord Karthikeya (Subramanya) Mercury: MahaVishnu Jupiter: Lord Dakshinamurthi Venus: Mahalakshmi Saturn: Lord Yama Rahu: Goddess Durga Kethu: Lord Ganesa or Indra. here are some remedies for the problems related to planets. 2. Recite Aditya Hrudayam (stotra) daily or Gayatri Mantra daily. 6000 times in 40 days. 5. Charity: Donate wheat, or sugar candy on Sunday. 7. Do Rudrabhishekam on Sunday. 1. Worship the ruling deity Gouri. 10000 times in 40 days. 5. Charity: Donate cow's milk or rice on Monday. 7. Pooja: Devi pooja on Monday. 8. Rudraksha: Wear 2 mukhi Rudraksha. 2. Recite Vishnu sahasranama stotra. 17000 times in 40 days. Soumyam Soumya gunopetam tam Budham Pranamamyaham. 5. Charity: Donate Udad dal on Wednesday. 8. Wear a 10 mukhi Rudraksha. 16000 times in 40 days. Buddhi bhutam Trilokesham tam namaami Brihaspatim. 5. Donate: Saffron or turmeric on thursday. 8. Wear a 5 mukhi rudraksha. 2. Recite Shree Sooktam or Devi stuti or Durga chalisa. 20000 times in 40 days. 5. Donate clothes to a lady on Friday. 7. Pooja: Durga Devi pooja. 8. Wear a 6 mukhi Rudraksha. 1. Worship Lord Hanuman or Lord Siva. 2. Recite Hanuman chalisa or any other Hanuman stotra. 5. Donate a buffalo or black oil (sesame seeds) on Saturday. 8. Wear a 14 mukhi Rudraksha. Shodasanama stotra of Dasharatha is an excellent remedy. Apart from this reciting the following dasanama stotra of Shani by Dasharatha near a Pepal tree is also a highly recommended one. 1. Worship Bhairava or lord Shiva. 2. Recite the Kalabhairav asthakam. 18000 times in 40 days. 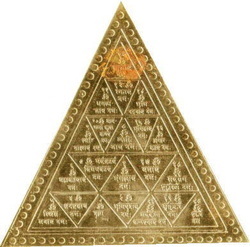 Simhika garbha sambhutam tam rahum pranamamyaham. 5. Donate: Udad dal or coconut on Saturday. 7. Pooja: Bhairav or Shiva or Chandi pooja. 8. Wear An 8 mukhi Rudraksha. 9. One of the best remedies for rahu is reciting the first chapter of Durga Saptasati. 2. Recite Ganesha Dwadasanama Stotra. 7000 times in 40 days. Roudram roudratmakam ghoram tam ketum Pranamamyaham. 5. Donate: A black cow or black mustard seeds on Thursday. 8. Wear a 9 mukhi rudraksha. 9. A very good remedy for Ketu is the reciting of Shiva Panchakshari Stotra. 5. Charity: Donate Masoor dal( red lentils) on Tuesday. 7. Pooja: Kartikeya pooja or Rudrabhishekha. 8. Rudraksha: Wear a 3 mukhi Rudraksha. Mars is also the remover of debts and the giver of wealth. The following is a highly recommended stotra of Mars for this purpose.